All transactions are safe and secure with a reliable history in online purchasing behind each of our associates. Buy the Peter Venkman Back Off Man I'm a Scientist t-shirt to own Ghostbusters clothing and merchandise. "Back off man, I'm a scientist." Let everyone know that it's not a smart idea to mess with a scientific professional. 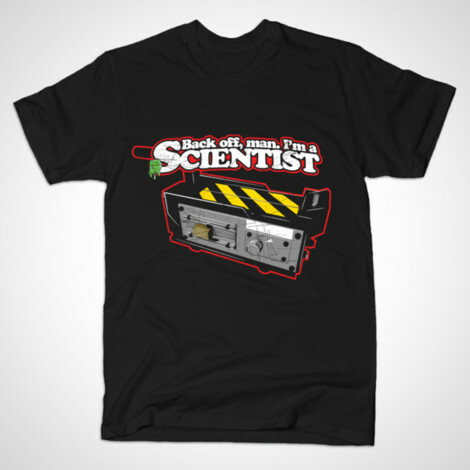 The front of this tee features the Peter Venkman quote, "Back off man, I'm a scientist." Wear it when you ride in your Ghostbusters ambulance car that is referred to in the movie as "Ecto-1." The car is really a converted 1959 Cadillac Miller-Meteor Ambulance that the team uses to get about the city. Buy the Ecto-1 toy car and tell everyone you're a scientist. In addition to the Peter Venkman Back Off Man I'm a Scientist tee above, browse the Ghostbusters Clothing Gallery for more apparel like men's and women's clothes, kids shirts or hoodies.